There are a lot of places for a Knuckle to leak oil. Here is a pretty easy and basic tip for assembling Knuckle heads that may help eliminate one. One thing I see a lot when I dissasemble Knuck heads is that once you remove the rocker boxes, often the lower spring covers (cups) will be loose. 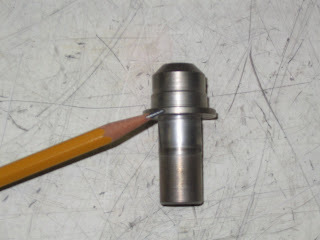 Since said cups are held in place by the valve guides, it is an indication that the guide has moved slightly. Obviously if that cup is loose there is nothing to keep oil from running out the bottom. What is not so apparent is that the replacement parts available today can be part of the problem! A stock OEM valve guide had a shoulder that measured approximatley .103". The stock OEM lower spring collar had a counterbore in the bottom of it that was approximately .093" deep. That means (if my math skills are still intact) the valve spring would put full spring pressure on the guide, holding it tight down on the cup, and in turn the cup tight down on the head. Unfortunatley, the likelyhood of finding a stock OEM guide is about the same as you stumbling on Elvis' personal Harley (signed under the seat: with love, Prissila). Besides, even if you found the guides, they wouldn't really be the ideal material for use with todays fuels. So it is a given that you will be using reproduction guides. Here's the problem, though. A typical reproduction valve guide will have a lip that measures only approximately .092". Those of you with higher math skills (or a calculator handy) already see the problem. That's right. 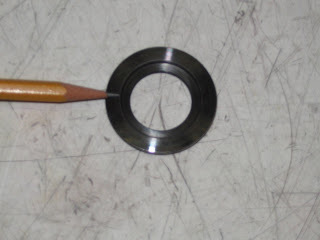 The lower collar will no longer hold the guide down, so if the guide moves at all there is nothing to keep the oil from seeping under the lip of the guide and through the guide hole in the cup. True there is still spring pressure on the cup (since the lower collar is now setting on the cup instead of the guide) but that presssure is not concentrated as it should be. My solution is to machine abut .010" off the bottom of the lower collar. I also use aircraft grade Permatex on both sides of the gaskets that go under the cups, as well as Three-Bond sealer under the lip of the guide itself. While it may be next to impossible to prevent every bit of oil seepage from your Knuckle top end, everything you can do to prevent it is a step in the right direction! This Sunday morning our pastor continued his series in the book of Romans. The subject was that of being a slave. The text was Romans chapters 6 and 7. One of the most profound statements found in this section of scripture is that every one of us is a slave. Either a slave of God, or a slave of sin. Another point was about the "benifits package" that comes with being the property of either of these owners. Romans 6: 20-22 spells this out; For when ye were the servants of sin, ye were free from righteousness. What fruit had ye then in those things whereof ye are now ashamed? for the end of those things is death. But now being made free from sin, and become servants to God, ye have your fruit unto holiness, and the end everlasting life. If the matter of who one would choose to serve was simply a matter weighing the benifits, then there is little doubt that everyone would choose to serve God. Holiness in this life, and everlasting life at the end. Pretty much a "no brainer" compared to the alternative of continueing in sin with death as the end. Unfortunatley the unbeliever has little desire for holiness in this life and no real faith that there is anything after death. The last point Pastor Voigt had (among other points that I have not mentioned) was that of of the saved being more than slaves in God's eyes. In John 15:15 Jesus said: Henceforth I call you not servants; for the servant knoweth not what his lord doeth: but I have called you friends; for all things that I have heard of my Father I have made known unto you. And again in 1 John 3: 1 the bible says: Behold, what manner of love the Father hath bestowed upon us, that we should be called the sons of God: therefore the world knoweth us not, because it knew him not. For myself, I feel unbeleivably blessed to be a slave of God, unprofitable though I am. To be called a friend? That is overpowering. And to be called a son? There just are no words! What a wonderful, kind, merciful God of grace we have! With the recent departure from the presidential race of John Edwards, this may not be as timely as it could be, but I still think the observations are pertinent . One of Senator Edwards main themes has been that of "Two America's". Of course John Edwards view is that there is a rich America and a poor America. A priveleged America and a downtrodden America. Most of the commentators that I hear and read vehemently deny this. I do believe that Mr. Edwards does have a point. However, I would paint the picture of Two Americas slightly differently. I beleive that there are Two Americas that stand in stark contrast to each other, and they can be found in the minds of the people. One group of people see an America that was founded by men of faith, with high ideals, and was a great force for good in the world. They see an America that was a Christian nation with Christian morals. They see our present nation as one that is at a crossroads, facing a crisis of societal decline. They can't help but see the fight over abortion rights, illegal immigration, gay marriage (and all the rest of it) as a sign of this country coming to the end of its greatness. They worry that the future of America is bleak, and yet they love what it once was and the remants of that grand republic that remain. They hate what they are afraid America may turn into. Another group of people see an America that was founded by greedy white men that stole the land and enslaved and oppressed anyone not of their creed or color. They see an America that used the Bible and religeon to justify that theft, slavery and oppression. They see our present nation as one that is at a crossroads, facing a crisis of these "fundamentalist" Christians standing in the way of human and humane progress. They can't help but see the fight over abortion rights, illegal immigration, gay marriage (and all the rest of it) as the last stand of the backward "puritan" oligarchy that is afraid of losing its power over the oppressed. They know that the history of America is disgraceful, and yet they love what it can be in the future, and the parts they have managed to change so far. They hate what they are convinced America once was. Of course the truth of the matter is somewhere in between the Two Americas that lie in the minds of these two groups. The true America of the past was neither so moral and just as the one group sees her, nor as dispicable and evil as the other does. The America of the future is surely not going to be the man made utopia that the one group envisions, and hopefully it will never be the moral wasteland that the other group foresees.